Our unique Colonial Revival home is on the National Register of Historic Places. 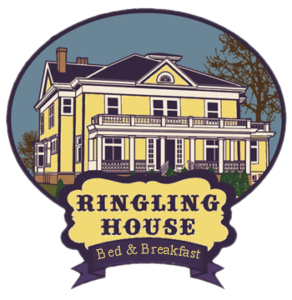 It was built in 1901 by Charles Ringling, one of the founders of the Ringling Brothers Circus, and was constructed with some of the finest materials and modern conveniences available. It has remained in the Ringling family for over 100 years, until now. Experience the grandeur of this intriguing accommodation by making your reservation now! We are located within walking distance to downtown Baraboo businesses and events. When booking multiple nights, you will get an additional 10% discount. Every sixth night of your stay is free! Many things are included with your stay: Off-street parking, Wi-Fi, home cooked breakfast, snacks, beverages, and use of common areas. Our flexible lodging options include adjoining rooms in most of our suites, if you wish to stay with family or friends. Devils Lake State Park, a mere 3.5 miles from Baraboo, has been ranked in the top 10 state parks in the nation by readers of USA today and 10 Best. It is a great place to explore and reconnect with nature and your loved ones. By staying with us, you are helping us maintain this beautiful historic property. We have en-suite bathrooms, updated electrical, and air conditioning in all of our rooms!